Just days after releasing Google Chrome 57 to the public, the Chrome team is pushing the latest update to Android device users. If you haven’t gotten yours yet, it should come in a few days at the most. Custom Tabs improvements seem to be one of the top features on version 57 of Google Chrome. Of course, there’s Progressive Web App support that’s deeply integrated with Android. As we noted earlier, a lot of the major changes in Chrome 57 are around Android and Chrome OS. You can read about that in greater detail in this article. Essentially, the Custom Tabs changes are on top of what Chrome has had since 2015. Custom Tabs is simply a way for apps to open webpages without actually launching the full browser. As such, you’ll only get basic Chrome functionality on these tabs. Not any more. Google Chrome 57 brings parity between custom tabs and your regular Chrome browser, and that means a seamless Chrome experience when an application opens a custom tab. 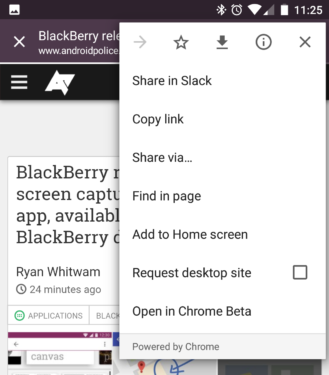 These new abilities include being able to save the page for offline reading, bookmarking, requesting the desktop version of the page/site, searching within the page (Find in page) and adding the site to your home screen. 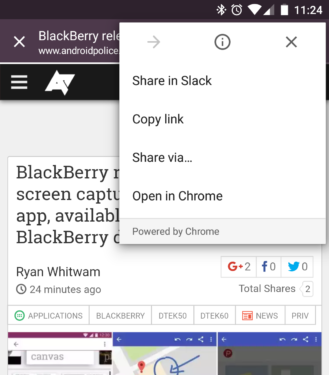 Chrome 58 takes that a step further and lets you open custom tabs links in a new tab, and you can preview the beta on your Android device by downloading it from Play Store. On Android, Chrome previously didn’t let you add your own search engines. You had a choice of 5 search engines: Google, Yahoo!, Bing, Ask and AOL. That’s changed with Chrome 57, and you can now add a recently-visited search engine as your web search default. Dubbed “wasm”, WebAssembly is still in its experimental stages. The primary objective for now is support for C/C++, with plans to support other languages in the future. Contributions to its development come from all the big names: Apple, Google, Microsoft and Mozilla. On Google Chrome 57, it is enabled by default on both desktop and Android releases. You can see a demo of it here. This feature gives your media notifications to show you more information, and allows the page to add additional buttons like seek and skip. It also brings in more metadata for you to see, like the artwork for an album. Here’s an example you can look at to see how it works on the new Google Chrome 57. What Else on Google Chrome 57? The address bar brings in more physical suggestions for places near you, video orientation will now automatically change on your device to match that of the video, search suggestions for articles are updated more frequently on the new tab page and they’ve brought in support for CSS Grid and more. The new browser version should be available through Play Store in a few days if it’s not there yet, but you can also install the APK signed by Google. It will simply upgrade the existing version of Chrome that you’ve got on your device.